Videos >> Latest News >> ఓటమి తరువాత రేవంత్ రెడ్డి ని కోడంగల్ ప్రజలు ఏమంటున్నారు..? ఓటమి తరువాత రేవంత్ రెడ్డి ని కోడంగల్ ప్రజలు ఏమంటున్నారు..? 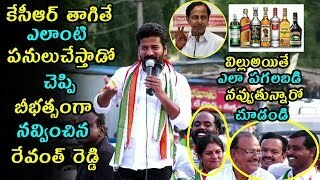 Kodangal Public on Revanth Reddy after Elections. Kodangal is a Town and Mandal in Vikarabad district, Telangana, India. It is named after the Kodangal Gram Panchayath. The town is also categorized as a Tahsil, Mandal, or Taluka, and constitutes 20 villages. The major mandals in the Kodangal Constituency area are : Kondangal Assembly constituency is a constituency of Telangana Legislative Assembly, India. It is one of 14 constituencies in Mahbubnagar district. It is part of Mahbubnagar Lok Sabha constituency. 2019 ఏపీ సీఎం ఎవరు ? పెద్దాపురం లో మీ ఓటు ఎవరికి ?